Twenty different types of acceleration were identified in A Nation Empowered. These forms are defined below. Additional information about relevant resources is included. In this form of acceleration, students enter kindergarten before they reach the minimum school entry age (which varies widely across states and districts). For more information, see the Early Entrance to Kindergarten page, as well as the chapter on Whole-Grade Acceleration and Early Entrance to Kindergarten in the 2015 report, A Nation Empowered. Students participating in this accelerative option attend first grade in their first year of school, either by skipping kindergarten entirely or by moving from kindergarten to first grade within the student's first school year. Students are placed in a grade level ahead of chronological age peers. Decisions to grade-skip a student must be made by a team of professionals using a wide range of data. The Iowa Acceleration Scale was created to provide an objective analysis of the data to assist in the decision-making process. The 2015 report, A Nation Empowered, contains chapters on both grade-skipping and radical acceleration. Students engaging in this option are given new content as prior content is completed and mastered. The practice is considered accelerative when the students' progress outpaces that of chronological peers in rate and level. In self-paced instruction, students proceed through learning and instructional activities at a self-selected pace. It is distinguishable from continuous progress in that the student has control over all pacing decisions. Students are placed in classes with older peers for a part of the day in one or more content areas. Students could physically move to a higher-level class for instruction, or they could use higher-level curricular materials within their original classroom. Subject-matter acceleration can also be used in tandem with a number of other accelerative options, including extracurricular programs, and whole-grade acceleration. Information about subject-matter acceleration decisions in STEM subjects can be found in IDEALSolutions. Also see Developing Math Talent and other books for details about accelerating in mathematics. The chapter about Talent Searches and another chapter on Acceleration and STEM Education in A Nation Empowered provide additional details about content acceleration. The chapter about Content Acceleration in A Nation Empowered includes a special focus on adapting the Core Curriculum while accelerating gifted students. More details about how to do subject acceleration are found on this page. Multiple grades are taught in the same classroom (i.e., fourth and fifth grades are combined into one class).Though not an accelerative option in itself, in some instances this practice may provide opportunities for younger students to engage academically and socially with older peers. It may or may not result in advanced grade placements for those younger students. The curriculum is adapted to include fewer introductory activities and less repetition. Adaptations should be made based on pre-assessment of content knowledge. The time saved may be used for more advanced content instruction or to participate in enrichment activities. This practice does not necessarily result in advanced grade placement. Students are provided instruction in less time than is typical (e.g., completing a one-year course in a semester or completing 3 years of middle school in two years). The time saved always results in advanced grade placement. Students are paired with mentors who provide advanced or faster-paced instruction. Ideally, mentorship would be used in a student's area(s) of interest, providing them opportunities to work with professionals in a field they could see themselves entering. Students elect to enroll in after school or summer programs or courses that confer advanced instruction and/or credit. Talent Search programs, for example, offer accelerated classes during the summer, many of which are content-based and employ fast-paced learning. See the chapter about Talent Searches in A Nation Empowered for more information. 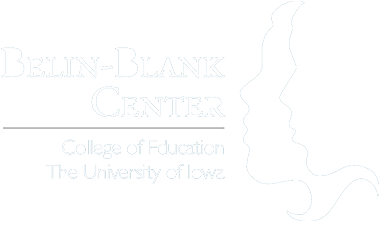 Other extracurricular programs at the Belin-Blank Center include WINGS, Blast, and Challenge Saturdays. In this form of acceleration, students take a course at one level and receive concurrent credit for a parallel course at a higher level. For example, a student may take algebra at the middle school, and earn credit at both the middle school and high school level. Another example of this practice is a "College in High School" program in which high school students take college-level courses taught by specially trained high school teachers. Those students commonly earn college credit upon successful completion of the course. The Advanced Placement (AP™) program, offered by the College Board, allows students to enroll in AP courses offered through their high school and/or take AP tests. High scores on AP exams may earn students advanced credit. To learn more about developing an AP culture at your school, check out this blog post. International Baccalaureate (IB) is a specialized educational program offered at authorized schools. Students who participate in this program, complete an IB high school diploma, and perform well on IB exams may receive advanced standing at selected universities. Students attend a selective high school program designed specifically for gifted students. Day schools and residential schools of this type offer advanced coursework, as well as opportunities for mentorships and internships, and students at these schools often complete high school graduation requirements in tandem with college coursework. The State Residential STEM schools chapter in A Nation Empowered provides examples of these types of schools. Students are awarded advanced credit for successfully completing some form of mastery test or activity. Students who earn this type of credit have often mastered material through independent study or internship experiences. Students enter the next level of school at least one year earlier than expected. This may be achieved with the employment of other accelerative techniques. More information about early entrance to college programs can be found here. A Nation Empowered includes a chapter on Early Entrance to College. Students who are accelerated in college complete two or more majors in a total of four years, and/or earn advanced degree(s) along with or in lieu of a bachelor's degree. Students graduate from high school or college in three-and-a-half years or less. Generally, this is accomplished by increasing the amount of coursework undertaken each year, but it may also be accomplished through dual/concurrent enrollment, distance learning, or extracurricular programs. Additional information and resources about the various types of acceleration can be found on the Acceleration Institute website, the Hoagies Gifted website, and the Davidson Institute for Talent Development website.